The Extech MN16A is a better (auto ranging) version of the MN24 of the same brand. A simpler to use device to measure everything from voltage and current to continuity, capacitance and temperature, it is a compact meter that can be used around the home as well as at work. Aside from its small size, main features are a large display, auto & manual ranging and ability to measure temperature and micro-amps. This is a fairly standard meter that has the measurement criteria needed for most tasks. You can test voltage to 600V, current to 10A (periodically), resistance up to 40MΩ) and temperature to 1400°F. Other test scales include capacitance, frequency and duty cycle as well as continuity. Note: When measuring higher current values – on the 10A input – be aware that you should only do so for a few seconds at a time. Circuit board components and architecture cannot cater to sustained high amperage, as is the case with many cheaper multimeters. 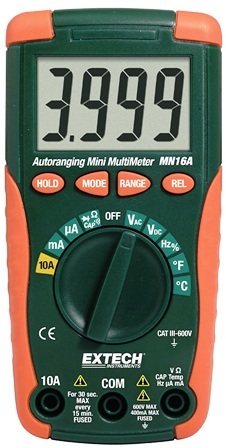 The MN16A has a clear dial with all the main ranges and measurements come via a clear screen. A range of buttons let users select the various modes and functions, freeze the display, and switch the range from auto to manual. Positives include Extech reliability, the low price, and micro-amps feature. The rating is CAT-III and it has auto power-off and low battery features. There are a few negatives, such as the lack of lead holders, the hard back (which sees it slide around), the scratchy beeper and tardy auto ranging. Extech multimeters are typically well built, although the MN16A is not as strong as some of the more established meters. It has a kick stand on the rear to let you perform hands-free tests, yet there are no probe holders built into it. There can also be an issue with the batteries falling out of position. Battery / fuse replacement is via a couple of screws on the reverse. Display: The easy to read LCD display is a standout feature of the Extech MN16A. It is clear and measures to 4000 counts. Refresh rate is twice per second. There is no backlight or bar graph. The Extech MN16A can also manual range, for those who require tighter results, though this won’t work on frequency or capacitance. Note: Auto-ranging is default. The auto power-down mode prevents the meter from using up vital battery power when not in use. After around 30 minutes, it will power off automatically. This can be disabled. Other features include a screen lock and a relative mode. The latter allows for the referencing against a previously stored value. The Extech MN16A is rated to category III at 600V. With this rating, you can safely test mains voltage directly, including distribution boards, circuit breakers, motors and switches etc. Fuses are of the ceramic type and are rated at 500mA for the main input and 10A for the (high) current input. Always use this type of fuse as opposed to the cheap, glass type which do not offer rupture protection. A good light use meter for electricians and DIYers, the Extech MN16A is an okay device with useful features. It measures temperature and micro-amps, though pros will want something more responsive. Alternatively, the legendary EX330 is probably worth shelling out a little bit more for the added quality and peace of mind.